Was born in Belfast in 1835. For half a century he has shown extraordinary and consistent activity in further­ing the interests of the sport of yacht-racing. His name is intimately associated with every reform movement either in connection with the Irish clubs or with the Yacht Racing Association. It was in 1859 that he joined the Irish Model, which afterwards became the Prince Alfred Yacht Club, with head­quarters at Kingstown, and which subse­quently received the Royal Warrant with H.R.H. the Duke of Edinburgh as Commodore. Of this club he became Rear-Commodore in 1875, and two years later was elected Vice-Commodore, a position which he has since held without intermission. In the year 1862 he joined the Royal Irish Yacht Club, and has acted on the sailing committee of that institu­tion for many years. In 1899 he was elected Vice-Commodore, a position he has since then continuously held. He was also one of the founders of the Royal Ulster Yacht Club, a member of its sailing committee, and for a season its Rear-Commodore (an appointment varied annually). 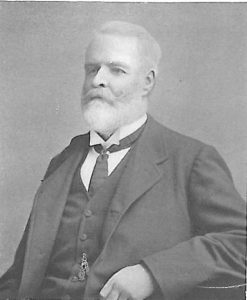 He is one of the original members of the Yacht Racing Association, the first Council of which he joined in 1875, and he assisted in formulating the original Yacht Racing Association Sailing Rules. 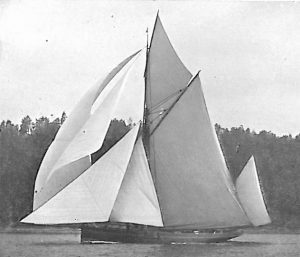 Nixie, Yawl, 81 tons. Mr. Henry Crawford. Mr. Crawford is also a certificated navigator. He passed the Board of Trade examination in 1876, and took out his certificate as sailing master. As a racing owner his career has been no less brilliant than as a legislator. With Nixie he won the handsome £150 Challenge Cup presented by the Marquis of Ormonde to the Royal Irish Yacht Club. The conditions were that ownership went to the boat winning for three seasons. He also owned Wave Crest, L’Eclair, Niobe, and now owns the Nixie. These boats won for him a large number of money prizes and cups. Clubs: Royal Alfred, Royal Irish, Royal North of Ireland, Royal Ulster.